"I don't like dogs, but there's something different about this one." "I don't like dogs, but how did you get her to do that?" "I don't like dogs, but this one is perfectly suited for therapy dog work." "Hi Cassie! There are some patients in this room who would love to see you." Eventually, I found out that she had been severely bitten by a dog when she was a child. In truth, she was afraid of dogs. One of my proudest moments was when she walked over to Cassie, rested her hand on her head and said "Such a beautiful and good girl." 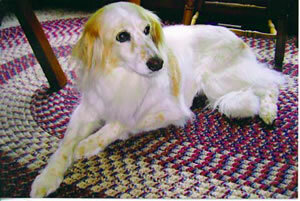 Cassie opened the nurse's eyes to what we each inherently understand about dogs. On one of our visits, we went into the room of a man who was terminally ill and had given up on personal hygiene. Cassie entertained him by responding correctly to the question "What's on top of a house?" Mind you, I could never get her to speak on command! The nursing staff told me that after we left him he requested a shower and a razor so he could look nice for Cassie's next visit. Hospitals can be difficult on all of us. When you're mentally challenged, I'm sure the difficulties can be magnified. They were for one of the patients on the floor. He was very angry and very vocal. The staff asked him if he'd like a visit with a dog but he wanted nothing to do with it. That's until he saw Cassie walk by. The staff advised me to be careful with him yet as soon as we walked in, his whole demeanor changed. While he stroked Cassie, we had a lovely conversation. The following week the staff told me that after Cassie's visit he was smiling, co-operative and a much better patient. Perhaps the most poignant moment while we were visiting came when another volunteer asked us to visit with a man who was near death. When we walked into his room the other volunteer laid his hand on the man's shoulder and said, "Sir, there's a dog here to see you." The man opened his eyes and asked, "Am I in heaven?" There are some that say dogs don't go to heaven. My reply is that it wouldn't be heaven without them. I hope my Cassie found that man and heaven is sweeter because of it.